Product categories of Carbon Steel Wire, we are specialized manufacturers from China, Carbon Steel Wire, High Carbon Steel Wire suppliers/factory, wholesale high-quality products of Cold Drawn Steel Wire R & D and manufacturing, we have the perfect after-sales service and technical support. Look forward to your cooperation! YB/T 5032-2006 Mild Steel Wire for Important Purposes. 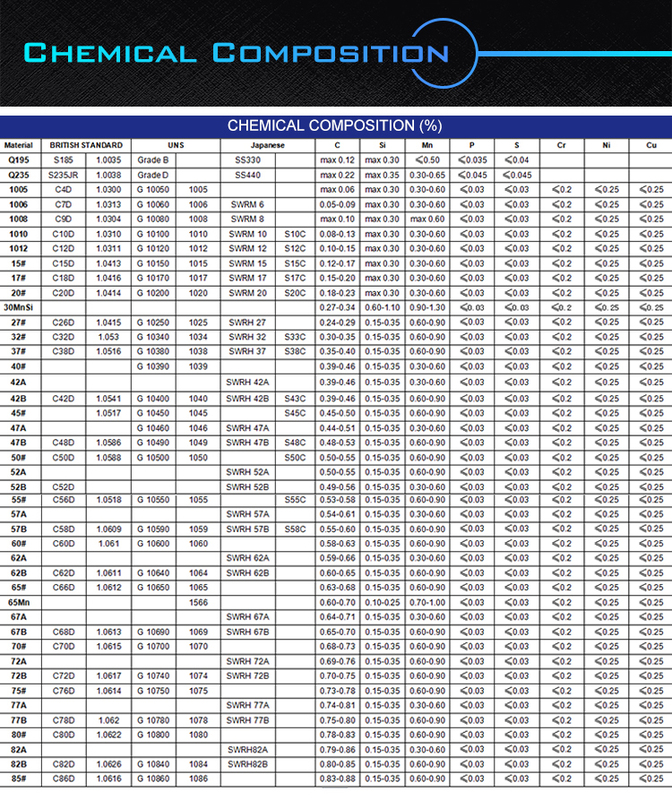 ASTM A853-04 Standard Specification for steel wire, carbon, for General Use. Usages: Mechanical Equipment, Engineering Vehicle, Motor Vehicle, Motorcycle, Accumulator Car, Bicycle, Fitness Equipment, Elevator, Steel Wire Screen, Mattress And Sofa, Umbrella Frame, Electronic Products, Motorcycle Spokes, Bicycle Spokes, Umbrella frame, ect. Spring Usages: compression spring, torsion spring, extension spring, agricultural machines, die springs, strip & wire forming springs.